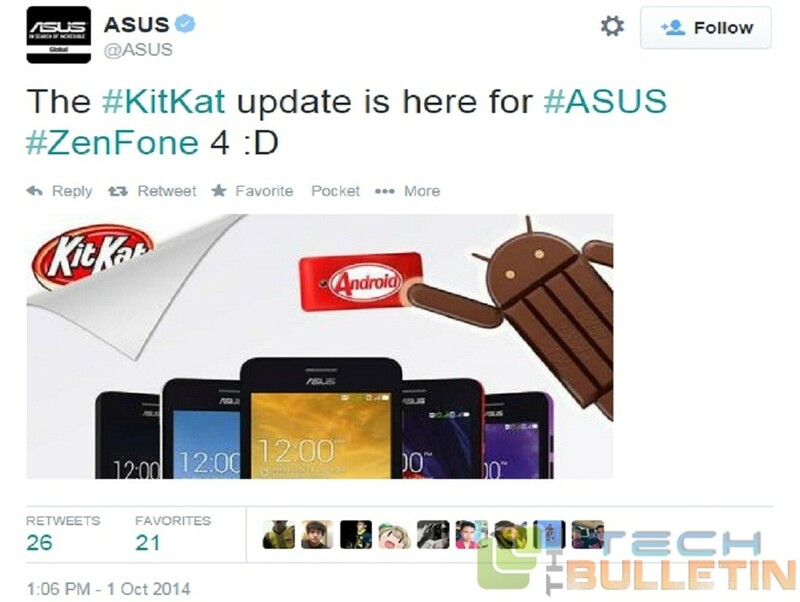 Asus has taken on its official Twitter account to announce that it has started rolling out the Android 4.4 KitKat update to the Zenfone 4 smartphone. The device was the only one that was pending to receive the update. Though Taiwanese tech giant has not revealed when it will be rolling out this firmware update to the large screened Zenfone 5 and Zenfone 6 devices, it appears like the update has made its way to some of the devices. It has been reported that the Zenfone lineup of devices receiving the Android 4.4 KitKat update will get call blocking, full dual standby for the dual SIM models, Do Not Disturb mode and video effects or filters. The update is also claimed to add customizable applications to the Quick Tool Box and Contacts, Call Logs, Messaging and Dialer applications to Extended Easy Mode for enhanced readability. Furthermore, it will bring extended Asus Zen UI Launcher that will include unread emails, unread messages and missed calls. In addition, the update will bring automatic image stabilization and filter effects to videos to the camera and photo editing. Also, there is support for Data Transfer with the Data migration assistance to transfer the user data from other devices to the Zen devices with additional PC Link and Remote Link. There is support for Omlet Chat with Bbbler Actors emoticons. Other new features include user-adjustable widget transparency, Swipe to skip cards and Quick Action Button to what is next notification.